Cheerleader stories are the legacy of generations of young women who have shared a desire to invigorate and inspire school spirit. They stretch back over many, many years, and while the times have changed, the stories themselves seem to have many common themes. Best of all, with the advent of social networking and blogging sites, it is easier than ever for cheerleaders of the past and present to share their stories with each other by building a mutual history online. Cheerleader stories roughly fall into two categories: Performance and Practice. Whether funny or poignant, the amount of work put into building a solid cheer squad and the pressures of performing for a crowd of cheering fans makes for many situations worthy of sharing. Initiations: One of the greatest parts of being a cheerleader is attending cheer camp. There are many different rites of passage for new cheerleaders, but one of the most common tends to be sending the younger cheerleaders into the showers first. Once there, the older cheerleaders steal their clothing leaving them to fend for themselves as they try to find their way back to their rooms or tents in the buff. While this may seem to be cruel exposure, the stories told on the Internet tend to show a wry, self-deprecating humor and a determination to treat the next batch of new cheerleaders in exactly the same way. Accidents: Ranging from amusing falls to wardrobe malfunctions (such as the squad that tried some new, tighter skirts that ended up lending literal meaning to the "splits") there are many cheerleader stories about things gone wrong. Stories about the mishaps and trials of learning cheer skills can help inspire others to persevere and make their practices have more meaning. Of course, mishaps are only funny if no one is hurt or feeling badly about the incident; to tell a story about an amusing accident when a person is still feeling badly about it is simply hurtful gossip. Bonding Moments: While they aren't shared as readily as the amusing practice stories, cheer camp and practices are where cheer squads form the connections that can last a lifetime. Supporting each other through difficulties, acknowledging each other's accomplishments and learning to change from individuals into a cohesive team can provide some of the most inspiring stories of all. That is why several movies about cheer competitions have become hits at the box office. Mishaps: As noted before, the stories of accidents are only funny if the person who had the accident thinks so too. However, if that is the case (and usually it is since cheerleaders have as much a sense of humor about themselves as any performer), usually the stories are even more funny because they happened in front of a crowd. For example, at one high school a cheerleader was doing handsprings at a basketball game when one of her shoes flew off, traveling through the air and landing with a swish into the opposing teams hoop! The crowd went wild, and even the referee was quoted as saying "You should play for the team, most of the boys at your school can't make a basket using just their hands!" Many stories of cheerleaders falling, stumbling or having equipment difficulties (throwing a pom pon into the stands, for example) are extra funny because they happen in the heat of the moment. The unintended benefit is that when these things happen during games, they tend to make the crowd have even more sympathy for the person it happens to and cheer all the louder. 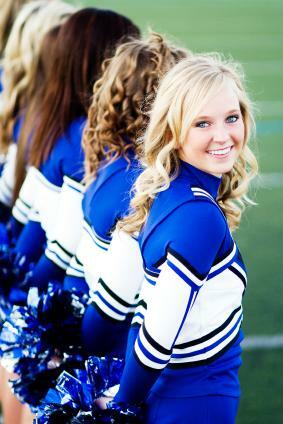 Triumphs: Aside from the games, there are many cheerleader stories about the competitions. These can be incredible stories of courageously overcoming stage fright, of working through injuries, of coming back from adversity and a squad delivering their own personal best. Sometimes these stories are about winning, but more often they are simply about accomplishing the goal of giving a cheer performance everything you've got. The best way to share cheerleader stories is through a blogging site, especially one that is advertised in your school. These blogs can be linked to others all over the world, not only from older former cheerleaders, but sometimes even from professional cheerleaders telling the stories of their careers. The Internet is an immense linked community that can bring cheerleaders everywhere together to share and benefit from their stories.